Event Description: An excellent teambuilding venue near to the ski resorts, Tahoe City, on the North Shore, is a cheerful place with shops, restaurants, bars and its fair share of Western history. Location History: Deep in the Sierra Nevada mountains, the breathtaking blue Lake Tahoe – 22 miles in length and 12 miles in width – is the highest lake of its size in the United States, with an elevation of over 6000 feet. It’s also one of the world’s deepest-and most beautiful. From the Native American Washoes, Tahoe’s first residents, to the exploratory party of John C. Fremont, with his scout, Kit Carson, to the miners trading silver from the nearby Comstock Lode of 1859 – Tahoe has always drawn visitors charmed by the fresh air, the clear water and the laid-back lifestyle. 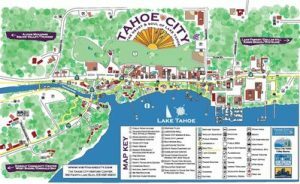 During your teambuilding treasure hunt… expect to learn more about Tahoe’s colorful past; explore a scenic nature trail; visit a log cabin; follow clues along the beach, and much, much more.